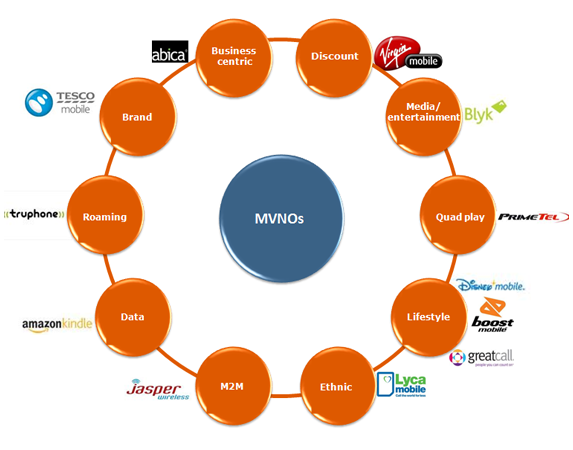 Many flavours of MVNO are possible; however each business must endeavour to come up with its own unique recipe for success. Nearly a quarter of existing MVNOs have chosen the discount base MVNO model and their service offering usually includes basic voice and SMS services at lower tariffs for both prepaid and postpaid customers, adding to it the flavor of cheaper handset devices. In terms of long term sustainability this approach can prove to be unyielding. An example is Virgin Mobile US which began by targeting a largely untapped market segment in an already saturated mobile market, with six national carriers and a significant number of regional providers already operating at the end of 2001. They targeted the 15-29 year old age group which untapped due to its poor or nonexistent credit. Since its launch in 2001 Virgin Mobile US attracted more than 5 million subscribers, making it the fastest growing and the most successful MVNO in the world. Virgin Mobile was acquired by Sprint in November 2009 for nearly $500 million and continuously evolved in time. It now offers also a broad range of innovative value added services. Youth oriented: Boost Mobile was founded in 2002 in USA by offering two-way messaging, wireless web including mobile social networking, Java-enabled gaming capabilities and nationwide instant communications. Harnessing their compelling marketing strategy that included sponsorship of action sports events, television programs, festivals, concerts, and other youth-centric activities, Boost Mobile aspired to attract and dominate today’s high spending youth market. And they succeeded. They now have over 5 million subscribers. Family oriented: Disney Mobile is the perfect example of how important business strategy and approach are for MVNOs, despite existing brand and service offering. Disney Mobile was launched as a family mobile service in the US in 2006 and it included parental control features, subscriptions to Disney content and games, and regular marketing campaigns. The project had two main purposes: to expand Disney’s consumer base to the mobile market and to provide families with a tool to manage their children’s mobiles usage. The MVNO suddenly ceased to exist in the US in 2007. Not a year passed before Disney decided to undertake the telecom challenge again by directing its attention towards Japan. This time they thoroughly evaluated their go to market strategy and improved it considerably. Disney teamed up with local service provider Softbank and became the country’s first MVNO offering both voice and data services. Disney strategically left back-end operations such as distribution, price planning, sales and billing to their partner and focused on enhancing their brand value and on bringing enthralling content into the partnership. Today Disney is the No. 1 mobile entertainment brand in Japan, with over 3 million paid subscriptions and has expanded its mobile business globally with main offices in Tokyo, Munich and London and content available in more than 40 countries through deals with 80 carriers and distributors. Elderly oriented: GreatCall has been targeting baby boomers and the elderly community in the US since 2006 and operates on Verizon Networks. They offer easy-to-use handsets, 24-hour Operator assistance and simple price plans. Furthermore, the operator adapted to its target customers’ needs and now offers additional services such as check-in calls, medication reminders, liveNurse, daily health tips, Wellness calls and many more services thus boosting their popularity. Their service is now very successful in the USA. These follow trends in the mobile industry, embracing content advertising on mobile phones. Such MVNOs offer free or subsidized mobile phone services to subscribers willing to view a number of targeted advertisements. Carriers, media brands and content companies are optimistic about the future of this model. The latest trend in mobile content advertising is the use of viral marketing. Through specially designed programs users can send recommendations for mobile content they like to their contact lists. A good example for this is the Italian Passa Parola, which has reached a total of 800.000 registered users, by the use of viral marketing alone. Blyk is a mobile virtual network operator launched in 2007 in the UK to target the 16-25 age segment, offering its subscribers several free texts and free voice minutes to any network. To benefit from the offer, subscribers agree to receive five to ten promotional texts a day and fill out an online subscription form for profiling purposes. Additionally, Blyk enables its subscribers to top up their monthly allowance if they exceed their subscription allowance. Blyk has been very successful in Finland and the UK and is now targeting Indian young people partnering with Aircel. This type of MVNOs target diverse ethnic groups in specific regions, looking to leverage international calls to their country of origin and ethnic community specific content. With several successful players in the market and many more appearing, forecasts are very optimistic in regards to the future of ethnic MVNOs. LycaMobile is a successful MVNO launched in 2006 in the Netherlands which is selling international prepaid SIM cards to people wanting to make calls abroad. It leased radio frequency from mobile phone network operators and formed partnerships in Australia, Belgium, Denmark, Italy, Netherlands, Norway, Spain, Sweden, Switzerland and the UK. LycaMobile now has over 6 million customers and a new customer joins them every 5 seconds. These MNVOs target high-usage and corporate subscribers, providing advanced services such as fax/data and group administration. Abica was launched in 2008 in the UK and targets small to medium size businesses, offering a bespoke range of business services, consumption monitoring and special tariffs for landline, mobile and data services allowing businesses to run their telecoms flexibly and efficiently. Abica’s turnover increased by 50 percent in 2009-2010 and they aim to reach $5 million by 2013. These leverage a strong existing consumer brand, and often a point-of-sale distribution network. The numerous supermarket MVNOs are good examples. By leveraging their brand value, their customer base and developed distribution channel, they are strong competitors for incumbents. Tesco Mobile was launched in 2003 by the dominant grocery retailer Tesco on the O2 network and it has a favorable position on the UK mobile market, being supported by a developed distribution channel and customer base, having now over 200 in-store Tesco phone shops. Tesco is able to reward customers in many ways through branded club cards. Tesco market share continues to grow quickly, both for prepaid and post paid customer base, with now over 2.6 million subscribers, by providing Tesco shoppers with convenient access to Tesco Mobile phones, accessories, broadband services, landlines, top ups and Tesco international calling cards. Tesco’s Phone Shop network is continuously developing across Tesco’s regional footprint in Slovakia, the Czech Republic, Poland, Hungary, Turkey and South Korea. Data MVNOs focus on the provision of data services, games, videos and other attractive applications to their subscribers. Juniper Research had estimated that the data revenues of MVNOs would increase to $25.2 billion in 2012. Content providers are usually dependent on service providers for delivery and billing of their content. Also, flat data rates are still not available in many parts of the world, consequently content download might prove to be quite expensive, therefore their content providers service consumption limited. On the other hand, many operators do not charge for data download when content is being downloaded. Supported by mobile payments, an opportunity arose for content providers to overcome these barriers by becoming data MVNOs. Amazon Kindle’s Whispernet was so successful because of Amazon’s innovative plug and play approach that enabled consumers to browse their shop, download and read books without the inconvenience of getting another internet connection for the new device. The customer gets a book reader device, content and internet connection for downloading content from Amazon. In May 2011, Amazon announced that over the previous year, they had sold more Kindle books than print books. These operators provide M2M (machine-to-machine)/telemetry services, enabling companies and consumers to enjoy new ways to manage and monitor their businesses, lives, and health. Clearly there is enormous potential considering also the hype around MHealth. M2M communications offer a plethora of opportunities to all parties involved, from product manufacturers, to HNOs, MVNOs through to end users. Jasper Wireless was founded in 2004 in California and provides the platform, applications, and design services needed to profitably connect and manage devices worldwide and today partners with prestigious top HNOs such as AT&T, Telefónica, Vimpelcom, KPN, Rogers, Telcel and Telstra. Quad play MVNOs provide services in the four major communication areas – broadband, television, fixed and mobile telephony altogether. Quad play MVNOs seem to gain more and more ground in the telecom space as subscribers tend to prefer such integrated packages which usually prove to be more attractive in terms of bundled price. PrimeTel PLC, the first MVNO from Cyprus and the first telecommunications company in Cyprus to offer Quad-Play bundled services, is the largest private telecommunication company in Cyprus that offers quad play services. The company owns and operates a truly regional network, spanning across Cyprus, Germany, Greece, Russia and the United Kingdom, providing city-to-city connectivity, data communications and IP-based services between key European and Middle East markets. PrimeTel is one of the few telecommunications operators in the region that can provide a full spectrum of connectivity and services and is proving to be very successful. These operators provide advanced lower cost roaming solutions, allowing subscribers to have multiple “virtual” local numbers and identities in different networks, thereby benefiting from local rates instead of roaming charges. Truphone is a global mobile communications provider founded in 2006, being the industry’s first mobile internet operator. Truphone focused on enhancing its subscribers’ capacity to easily and affordably keep in touch with friends, family and business contacts all over the world whilst roaming. Headquartered in London and with offices in the United States, Australia, Hong Kong, the Philippines, Spain, the Netherlands and Portugal, Truphone offers a multi-country single-SIM-card service that combines local call plans, international local numbers and Truphone’s international VoIP network. Truphone is either partnering in various countries with operators to offer its service and where not possible, forms a true MVNO relationship with local operators, in which Truphone becomes the service provider of choice.